I understand that as we get older we tend to repeat ourselves. However, some things need to be repeated! I do not want you to miss the huge sale that Needle Nook of LaJolla is having on their Brenda Stofft trunk show! 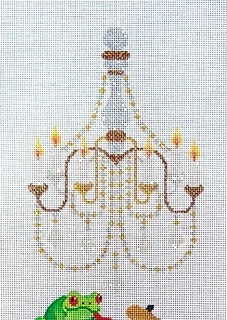 Remember we have several Brenda Stofft designs lined up for our upcoming Online Mystery Classes. So, what's the big deal? 25% off! That's the big deal. And it applies to orders as well. And the sale goes to the end of the month. From my limited research this appears to be a fantastic deal for you. If you are interested you need to go to their website and place the orders - no need to phone the shop. Easy peasy - right? I had a fantastic week there and it was great, as usual, seeing friends from past retreats and meeting some new ones too. The majority of attendees are repeaters as they get the first opportunity to sign up for the upcoming year due to loyalty, but a few newbies get to join the ranks too! I had a couple students that were new to the retreat and some new to my class and some repeaters. But one thing for sure that I did have and that was FUN. Oh my gosh what a bunch! Loved every minute of it! Last minute touch ups while getting ready for the masses. You need to really consider making this one of your 2018 Events! Check it out - I bet while you are over there taking advantage of the great price on the Brenda Stofft canvases that you can find more info on the retreat for next year too. 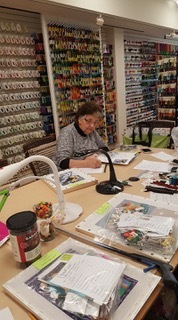 The new QUICKIES classes are in full swing. The first one scheduled for mid-Summer is the USA Stars from Raymond Crawford. 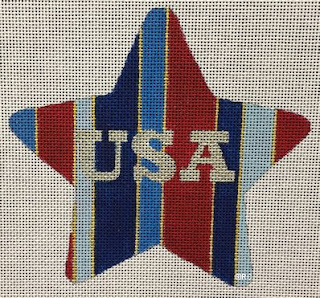 These are quick little projects that you can carry in your purse or briefcase and stitch along as you have a few minutes in your day. The first is a cut canvas of 9x9 with design area approximately 5x5. All techniques - whether 2 or 20 - will be covered in a 2-lesson posting in a secret Facebook page in a pdf format. Come join us! 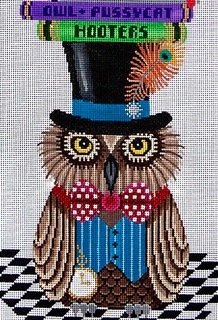 First up on this series is the Nutty Professor from JP Needlepoint - Isn't he fabulous! This guy is going to be so much fun. The concept of this class is that you will get a lesson when you get it - basically. We hope to start early to mid-Summer. And, our first lesson will begin at the bottom and work up. So our first concentration will be on the wonderful Professor. Oh my goodness! Just look at him! 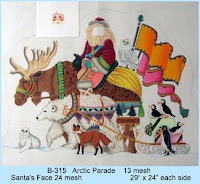 We will try to have thread/embellishment kits for those who need them. The canvases are scheduled to arrive next week so we will have a better idea of what assistance we can provide. Mercy! I am having so much fun putting stuff together for this upcoming riverboat cruise! October 19 will be here before we know it! And I am sure that 50+ other people are just as excited as I am! Kits have been ordered for the optional class and those who have paid should have received their kits by now. Please let me know if you have not received yours by emailing me at duodesignsinc@yahoo.com. 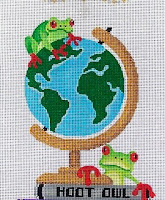 This limited time exclusive design is on a 12" x 14" cut 18 ct canvas with design area of approximately 8 x 10. For more information contact me at duodesignsinc@yahoo.com if you want to participate in the optional class while we are in Italy. While we have 50+ participants coming with us I understand there are still a few staterooms available. Viking Travel is handling this fabulous trip for us. Come on and join in the fun. You still have time! Gosh, we said goodbye last week to our fabulous Pillow Collage and welcomed our beautiful Menorah. We concentrated on the background and the flames for Session One. Next up for Session Two - who knows what's in store? 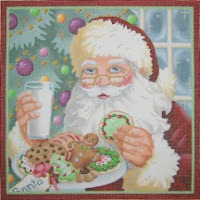 Session 5 for Santa's Reward gave Santa a fabulous beard! 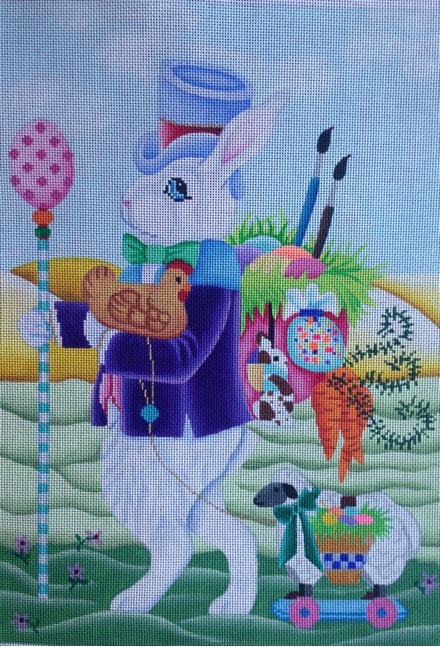 Then the Large Easter Rabbit from Brenda Stofft had Session 3 revealed. This gentleman now has a full backpack with lots of Easter goodies and toys. Last, but not least, is the Steampunk Fox who received his Session 2. We finished the hills around our wonderful fellow and filled the trees. Can't wait to see what happens in the next session! Well, that should be enough to keep me busy for a few days. 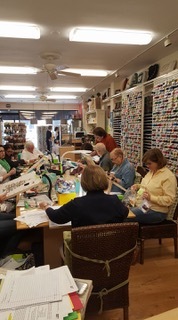 I'm writing stitch guides for my upcoming Embellishment class at Chandail in May and preparing for the wonderful retreat with Piney Pointers at LaTorretta resort in Conroe (?) TX. That is a marvelous place to 'work'. 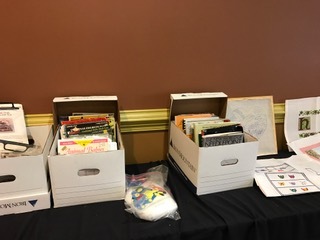 TRUNK SHOW DISCOUNTS ON CLASS STUFF! 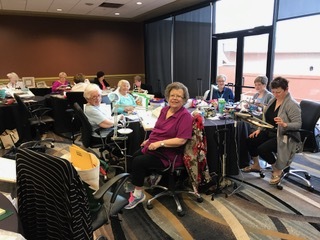 ALERT: I am in the company of Jill from Danji and I have been advised that if you plan to participate in the SONGBIRDS class the order deadline is this week! So don't dilly dally or you might miss having your canvas for the first lesson or two! 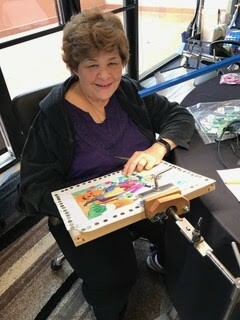 Most of you know that I am teaching at the Needle Nook of LaJolla Retreat. And, guess what? They are having a Brenda Stofft trunk show! So? What does that mean to you. Well that means if you are enrolled in some of my upcoming Online Mystery Classes it can be a huge savings for you. So, what's the big deal? 25%! That's the big deal. And it applies to orders as well. And the sale goes to the end of the month. From my limited research this appears to be a fantastic deal for you. 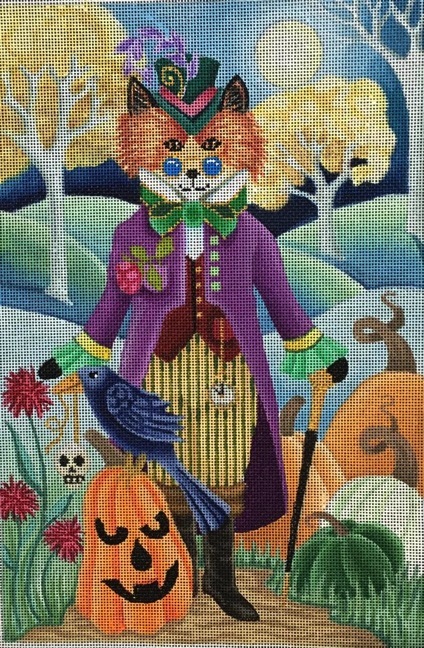 If you do not see the canvas you need for a particular class, just ask them for the Steampunk Owl or whatever for Sandy Arthur's Online Mystery Class and they will happily order it for you. As I said I'm teaching here and today is the second day of classes. We will finish off on Monday - 😭😭😭. I have such a fantastic group of students. Fortunately for me, many of them are repeaters - I cannot tell you how special that makes me feel. And this year we have added a fabulous gentleman to our group as well - brave soul. Little did he realize what he was in for - we will be gentle. I have a huge variety of designers that we are covering this year which means a huge amount of techniques. How was I born so lucky to be able to play with my friends all day???? Can't ask for anything more! 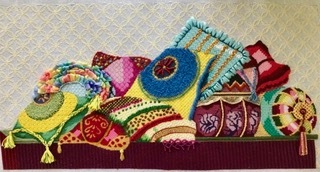 Speaking of Online Mystery Classes, this was the month that we said goodby to the amazing year-long class on Pillow Collage from Needlepoint of Back Bay. What a wonderful journey. We had so much fun with this. And the techniques covered - unbelievable the number of things we discussed, cussed, loved, hated, conquered, etc., etc. 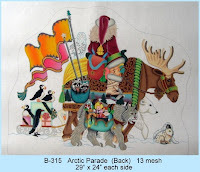 We painted, we couched, we appliquéd, we beaded, we did ribbon work, we padded, we ruched, we did or nue`, we made tassels - thread and beaded, we made cords,we used unusual threads and devices (toothpicks for instance), we second guessed the designer and we improvised, All in a day's work - or year in this case. But most exciting for me was to see students add their own interpretation to areas as we worked. More and more are moving away from the fear of changing - the stitch, the thread, etc. It was so rewarding and I think the majority enjoyed the journey with me. But, as one leaves, a new one comes on the scene. 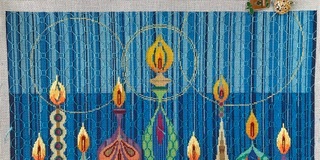 This month's new design is the Menorah from Tapestry Fair. 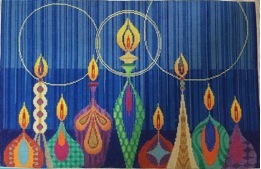 As with many of my classes we started with the background and the candle flames. 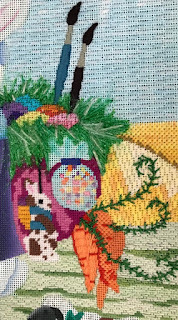 This class works for the large canvas, pictured, as well as the individual canvases - stitches are the same. 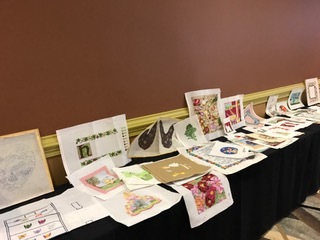 Still time to join if you want - just email me at duodesignsinc@yahoo.com and we'll get you in the secret Facebook Page and on the road to finishing another great project! And the amazing thing is that time really flies while we are playing with these gems. 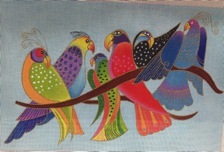 If interested be sure to scroll down through older posts to get the birds eye view of the scrumptious upcoming classes. As you go you will find some newer ones we add along the way. But, the major agenda is posted on December 19 where the original list for the whole year was posted - but like I said we kinda added to it as we went along. Again, just email me at duodesignsinc@yahoo.com with questions or to get enrolled in some of these great adventures! I am thoroughly enjoying stitching on these guys. 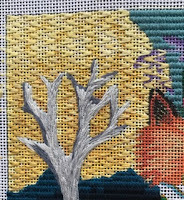 It will soon be time to begin the class and I am hopeful of sharing the stitched models with you before too much longer. Remember these classes are small and are made up of only 2 class postings. Also, the kits are all inclusive. 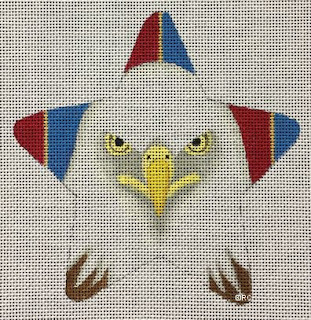 First up is the USA Star. Contact me at duodesignsinc@yahoo.com to be included in the class or for additional information. Back to work until next time . . . . .
ONLINE CLASSES FOR ALL SPEEDS! We have all been in those classes where there is at least one turbo stitcher and one turtle stitcher right? And there is nothing wrong with either approach. They each have their own agenda. And then there are all the in-between stitchers of those two categories. Well, Online Mystery Classes are no different. 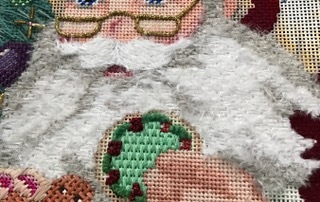 I have some stitchers that almost have the lesson finished before I push the button to post it in the secret Facebook Page. I love them dearly! Because of them I sometimes learn that a different approach resulted in using more thread than I might have suggested, or that there is a typo on page such and so, or I have transposed numbers (which is a frequent occurrence for me), or that a question arises that might help me add more clarity to a specific technique. Students love them too. I have had some say that they hang back and wait until others get through the lesson so they know if there is an issue. As most know, trying to satisfy the masses is impossible. But you have asked that I provide a materials list before the lesson starts and I generally try to do that. 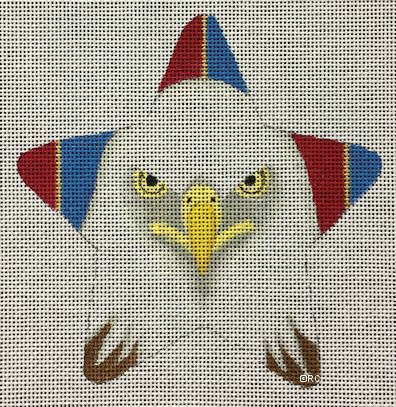 However, I have not always completed the stitching so some things are a guess. That is why there is always a disclaimer at the beginning of the posted materials list that I might need another thread, that I might decide against a thread I have listed, or we might need more skeins than originally thought. But we all seem to get through it happily. There are others that wait until all the lessons are posted before they begin. These are the students that ask a question 3-6 months after we have moved on. That is perfectly okay. In fact, it is one of the beauties of the Online Mystery Classes. Problem is, I have addressed many other issues on other matters in between the active class and the time when they ask so it might take me a little while to regurgitate the process I used a few months back and then I can address their question. While the first few years of Online Mystery Classes have been handled in pretty much a standard way, we are adding a few twists going forward. The standard classes were all for a 6-month period. This meant that a lesson was posted once a month for 6 months at a cost of $150 for the 6-lesson packet. 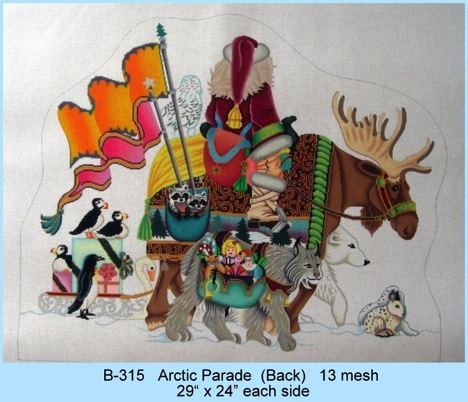 Next, we got requests for special classes - such as the humongous Arctic Parade canvases. These special classes involve a guarantee of a minimum number of lessons. However, the catch is that they are not regularly scheduled. Working so far. On the flip side, we have added a new category called 'Quickies'. These are classes that are going to be smaller projects and they are only going to involve 2 lesson postings. That does not necessarily mean that the posting will only have a couple stitches, it means that no matter what, everything that I have included for that design will be divided into 2 postings. These Quickie classes will be all inclusive! All materials and lessons for one price. These will vary depending on the cost and number of materials included. This will begin early to mid-summer. Email me for full details at duodesignsinc@yahoo.com. Hopefully I will be able to share the finished products in the next couple of weeks. I hope Italy is prepared for the Party on the Po that is going to converge upon them in October! We have 50 paid participants and 10 more in the wings! Woo Hoo! What a group. Do you know what this is? So for those that have ordered and paid for the Exclusive Class Kit, they have all been shipped and should be received soon if not already! 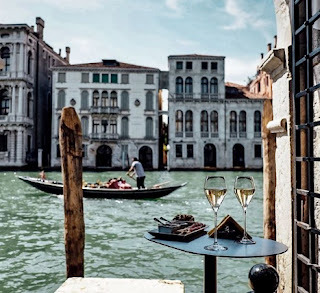 The deadline for ordering the Venice Memories class kit is May 15. 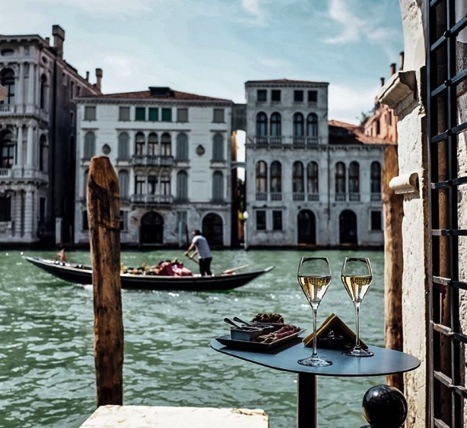 This is just one of many possible things the participants will be playing with while 'resting' from their Italian adventures through Milan, down (or is it across) the Po, Venice and the neighboring little islands! It is becoming more and more real as each little chip falls into place! So, so exciting. I will be sharing some Italian ornaments soon with you as well. 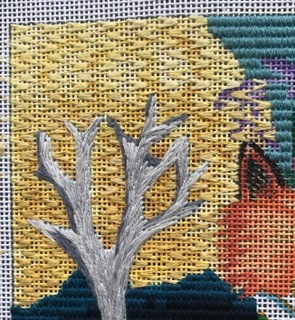 Stitching the backgrounds currently. Won't be much longer! 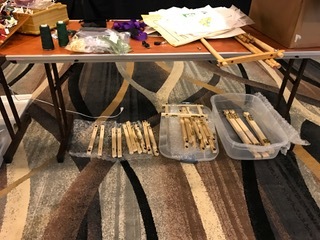 And, as if that isn't enough to do, I will be heading our this week to teach at the Needle Nook of LaJolla Annual Retreat. Always fun with this group! STITCH-AWAY, STITCH-AWAY, WHAT A BEAUTIFUL TREAT! I have the wonderful privilege of sitting here looking through floor length windows out on a fantastic lake, beautiful wildlife entertaining me and surrounded by friends. Not only friends, they are stitching friends! We are at the Lone Star ANG Stitch Away at Conroe, TX at the LaTorreta Resort. Such beautiful pieces of work! It is unbelievable the beauty that is present in this room! Every kind of design you can imagine being worked by fantastic stitchers using their own stitches, or the helpful guidance of creative stitch guides and/or input of those present. Of course there are many more but as you can see I am prejudice! And . . . it's my blog! 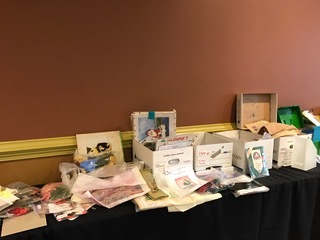 Then one whole side of the room is filled with canvases, threads and accessories galore in the Lone Star Chapter, ANG stash sale. No matter how hard you try not to it seems you always manage to find something you just have to have. Add to that daily drawings! 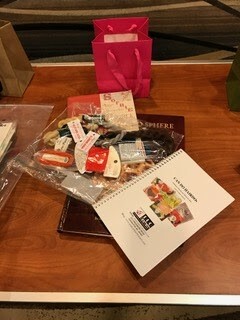 Some very nice things - as of this writing yours truly has not managed to get one of those door prizes! Still more to come so fingers crossed. Anything look familiar here? For those who like the pleasure, there is a masseuse available - she is set up right outside the door and she is definitely being utilized. This is one service I have yet to take advantage of no matter how wonderful all say it is. Believe it or not, amongst all this, my stitching is work related. I am totally consumed by my upcoming classes and loving every minute of it! I am most anxious to share with all my class participants what I have managed to accomplish here. 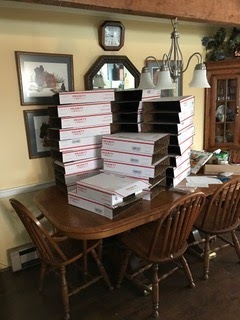 But, alas, they must wait until it is time to post!